With Chloe, Lanvin and Alexander Wang's high-style high-tops selling out and the Olsen sisters on board as creative director at Superga, sneakers are officially a big-time fashion statement--and drawing from the picture above seemingly interchangeable with designer, statement-y heels. The sneakers du jour often feature pop art-like graphics and motifs, neon and dayglo. 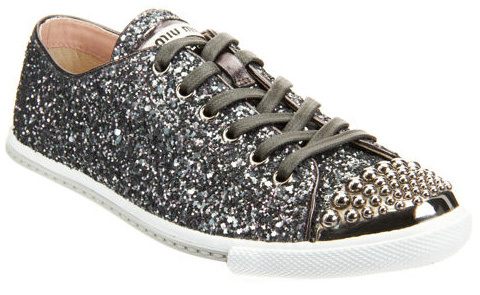 Some of them are covered in sequins and studs, like the ones below from Miu Miu. I came across these sparklers at Barneys in Beverly Hills last weekend with a friend. They were the last pair in the store. I tried them on but alas they were too small for me. They did fit my friend though and she ended up going home with them. No, seriously, I am happy for her. Its time I upgraded my sneakers...thanks for the chic reminder!